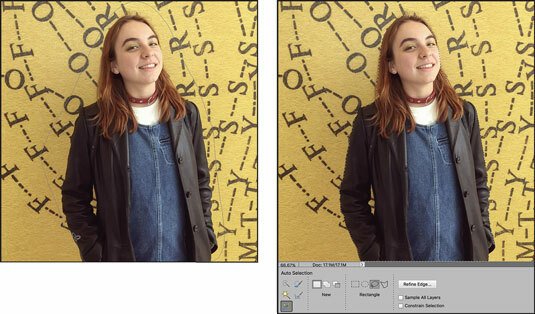 This new selection tool in Photoshop Elements 2018 is made for you. The new Smart Selection tool lives up to its name by quickly and easily selecting your desired object. This intelligent tool takes your rough selection, analyzes the pixels, and determines the object it thinks you want within that rough selection. It then snaps to that object. Select the Smart Selection tool from the Tools panel. The tool looks like a wand with three small yellow stars around the end, as shown. It shares the same Tools panel space with the Quick Selection, Selection Brush, and Magic Wand tools. You can also press the A key to cycle through those tools. The new Smart Selection tool easily and quickly selects your object. This tool works in either Expert or Quick mode. Choose which tool you want to use to make your rough selection in the Tool Options. You can choose from the Rectangular and Elliptical Marquee tools or the Lasso and Poloygonal Lasso tools. New Selection: The default option enables you to create a new selection. There are also options to add to and subtract from your selection. Sample All Layers: If your image has layers and you want to make a selection from all the layers, select this option. If you leave it deselected, you will select only from the active layer. Constrain Selection: This option will keep your marquee selections perfectly square or circular. Make a rough selection around the desired object in your image. The Lasso tool and the girl are selected, as shown. When you release your mouse after making the selection, Elements smartly analyzes the pixels and snaps to your selected object. If you need to fine-tune your selection, click the Refine Edge option in the Tool Options and adjust the settings, as desired. If you think the new Smart Selection tool is a game changer, you must check out the new Background Changer Guided Edit. This new edit, found under the Special Edits in Guided mode, lets you change the background in your image and even add a custom background.